Attached please find some pictures of my recently finished Power Skiff 14'. I ordered the plans in October '98 and finished the boat in August '99. I built the boat in my garage in my spare time and enjoyed every minute of it. I never thought building a boat could be so much fun and rewarding. I modified the original plans by installing a console ( in order to have remote steering) and an additional seat. The extra work really paid off... she's a joy to drive. I have received more compliments than I ever imagined. 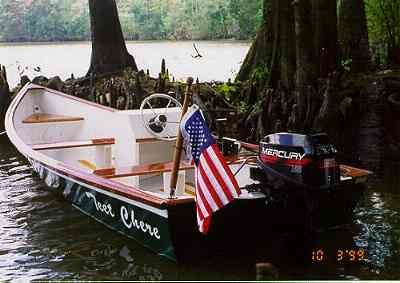 Many people have asked if it's a refurbished old boat and I proudly respond by saying, "No, I built her from scratch." Thanks Glen-L, for all your help along the way by allowing me to bounce ideas off of you and by answering all my questions during the building process. This was my first boat building experience, but I'm sure it won't be my last.